"Omniphobic" might sound like a way to describe someone who is afraid of everything, but it actually refers to a special type of surface that repels virtually any liquid. Such surfaces could potentially be used in everything from ship hulls that reduce drag and increase efficiency, to coverings that resist stains and protect against damaging chemicals. But the omniphobic surfaces developed so far suffer from a major problem: Condensation can quickly disable their liquid-shedding properties. Now, researchers at MIT have found a way to overcome this effect, producing a surface design that drastically reduces the effects of condensation, although at a slight sacrifice in performance. The new findings are described in the journal ACS Nano, in a paper by graduate student Kyle Wilke, professor of mechanical engineering and department head Evelyn Wang, and two others. 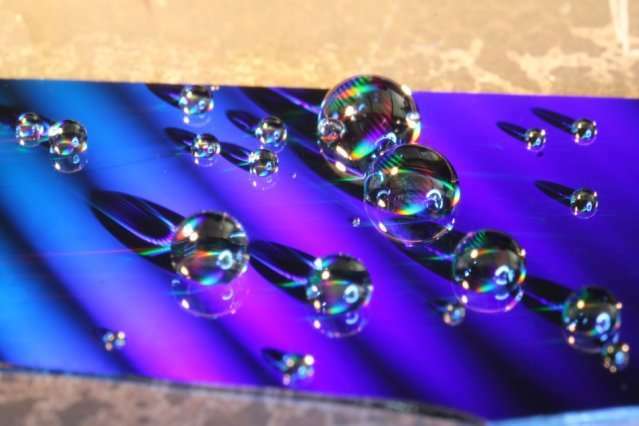 Creating a surface that can shed virtually all liquids requires a precise kind of texture that creates an array of microscopic air pockets separated by pillars or ridges. These air pockets keep most of the liquid away from direct contact with the surface, preventing it from "wetting," or spreading out to cover a whole surface. Instead, the liquid beads up into droplets. "Many liquids are perfectly wetting, meaning the liquid completely spreads out," says Wilke. These include many of the refrigerants used in air conditioners and refrigerators, hydrocarbons such as those used as fuels and lubricants, and many alcohols. "Those are very difficult to repel. The only way to do it is through very specific surface geometry, which is not that easy to make," he adds. Various groups are working on fabrication methods, he says, but with surface features measured in tens of microns (millionths of a meter) or less, "it can make it quite hard to fabricate, and can make the surfaces quite fragile." If such surfaces are damaged—for example, if one of the tiny pillars is bent or broken—it can defeat the whole process. "One local defect can destroy the entire surface's ability to repel liquids," he says. And condensation, such as dew forming because of a temperature difference between the air and the surface, acts in the same way, destroying the omniphobicity. "We considered: How can we lose some of the repellency but make the surface robust" against both damage and dew, Wilke says. "We wanted a structure that one defect wouldn't destroy." After much calculation and experimentation, they found a geometry that meets that goal thanks, in part, to microscopic air pockets that are disconnected rather than connected on the surfaces, making spreading between pockets much less likely. The features have to be very small, he explains, because when droplets form they are initially at the scale of nanometers, or billionths of a meter, and the spacing between these growing droplets can be less than a micrometer. The key architecture the team developed is based on ridges whose profiles resemble a letter T, or in some cases a letter T with serifs (the tiny hooks at the ends of letter strokes in some typefaces). Both the shape itself and the spacing of these ridges are important to achieving the surface's resistance to damage and condensation. The shapes are designed to use the surface tension of the liquid to prevent it from penetrating the tiny surface pockets of air, and the way the ridges connect prevents any local penetration of the surface cavities from spreading to others nearby—as the team has confirmed in laboratory tests. The ridges are made in a multistep process using standard microchip manufacturing systems, first etching away the spaces between ridges, then coating the edges of the pillars, then etching away those coatings to create the indentation in the ridges' sides, leaving a mushroom-like overhang at the top. 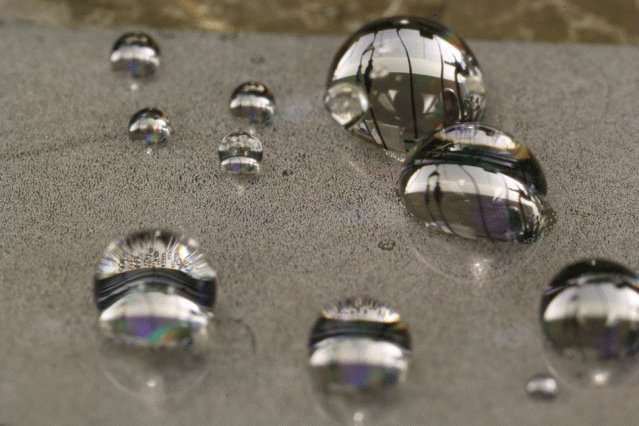 Because of the limitations of the current technology, Wilke says, omniphobic surfaces are rarely used today, but improving their durability and resistance to condensation could enable many new uses. The system will need further refinement, though, beyond this initial proof of the concept. Potentially, it could be used to make self-cleaning surfaces, and to improve resistance to ice buildup, to improve the efficiency of heat transfer in industrial processes including power generation, and to reduce drag on surfaces such as the hulls of ships. Such surfaces could also provide protection against corrosion, by reducing contact between the material surface and any corrosive liquids that it may be exposed to, the researchers say. And because the new method offers a way of precisely designing the surface architecture, Wilke says it can be used for "tailoring how a surface interacts with liquids, such as for tailoring the heat transfer for thermal management in high-performance devices." Chang-Jin Kim, a professor of mechanical and aerospace engineering at the University of California at Los Angeles who was not involved in this work, says "One of the most significant limitations of omniphobic surfaces is that, while such a surface has a superior liquid repellency, the entire surface is wetted once the liquid gets into the voids in the textured surface at some locations. This new approach addresses this very limitation." Kim adds that "I like that their key idea was based on fundamental science, while their goal was to solve a key real-life problem. The problem they addressed is an important but very difficult one." And, he says, "This approach can potentially make some of the omniphobic surfaces useful and practical for some important applications."